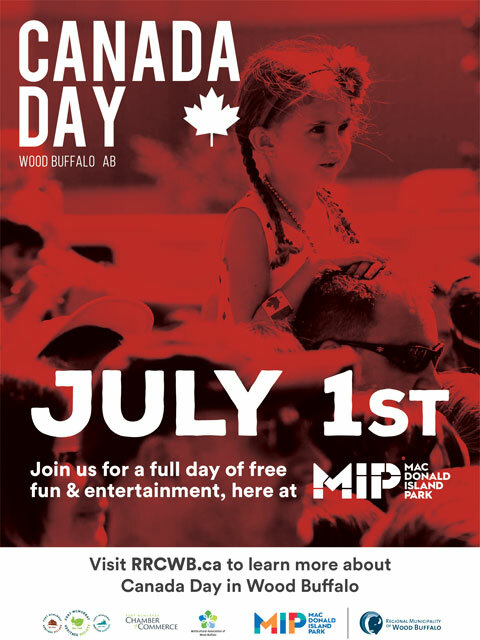 The Regional Recreation Corporation of Wood Buffalo (RRC), in collaboration with the Regional Municipality of Wood Buffalo (RMWB), is pleased to announce the Canada Day events that will take place at MacDonald Island Park on July 1, 2017, as the nation celebrates its 150th birthday. Beginning at noon on July 1, children and families can enjoy a craft carnival, face painters, bouncy castles and the Syncrude Balloon Twisters at the Suncor Community Leisure Centre at MacDonald Island Park. This year the Main Stage entertainment and Beer Gardens for the Canada Day festivities at MacDonald Island Park will move to a convenient new location in the parking lot area located next to the Baseball Stadium at Shell Place. Children’s entertainment on the Family Main Stage presented by Mix 103.7 FM will feature performances from Thomas & Friends at 1:00pm and 3:00pm. Two very special meet and greets will take place this year, with Teenage Mutant Ninja Turtles Donatello and Leonardo greeting fans in the Meet and Greet Tent at 2:00pm and Marshal and Chase from Paw Patrol on duty for meet and greets in the tent at 4:00pm. The evening entertainment at the Music Main Stage presented by Country 93.3 and Rock 97.9 begins at 8:30 pm and features popular Wood Buffalo performers The Veins, The Sissy Fits and Craig Moritz. At 11:59pm, the annual Grand Finale Fireworks presented by Syncrude will light up the sky as Fort McMurray celebrates 150 years of confederacy and Canadian pride.